Maj. James M. Bradford, 52, as been named by Hillsborough County Sheriff Chad Chronister as the new commander of District IV. He starts work in the Ruskin office Jan. 8. South Shore’s 160 deputy sheriffs are about to get a new commander, and he’s not exactly a new face in the community. Come Jan. 8, Maj. Jim Bradford, 52, a 28-year veteran of the Hillsborough County Sheriff’s Office, will become District IV’s sixth major. He will replace Maj. Rob Bullara, who is retiring after more than three-and-a-half decades in law enforcement. “I’m going to start meeting with neighborhood associations and civic groups to gauge what (their members) believe the problems are with crime, and then work with my staff in addressing those issues with a comprehensive plan of action…to make people feel safe in their homes, at their places of business and where they play,” Bradford said. Bradford’s first appearance in South Shore was when, as a college intern, he rode the streets of Ruskin, Sun City Center and Wimauma with Deputy Lester Hathcox. Bradford graduated from the University of South Florida in Aug. 1988 with a bachelor of arts degree in criminology. The New Jersey native moved to Cape Coral with his parents when he was 15 and graduated from Cape Coral High School in 1984. He was employed by Busch Entertainment Corp. during college and the year after he graduated while his application for the Tampa Police Academy was being processed. Ironically, it was HCSO Detective Rob Bullara who performed his background check. He received his law enforcement certification through the academy Dec. 1, 1989. Maj. Rob Bullara, 60, is retiring from the Hillsborough County Sheriff’s Office after 36 years as a deputy. For the past three years, he’s been commander of District IV. Bradford became a patrol deputy and trained in Ruskin, Sun City Center and Wimauma, which was then part of District II. He was promoted to detective in 1993. As a detective, he worked in burglary, robbery, homicide and intelligence and was a patrol and detective divisions supervisor. His sergeant in homicide was Bullara. As a sergeant, Bradford, Capt. Rob Bullara and Maj. Craig Latimer were on the transition team in 2006 that brought child protective investigations on a contractual basis to the Hillsborough County Sheriff’s Office from the Florida Department of Children and Families. He left the unit in 2009, returned as a captain in 2014 and was promoted to be its major two years later. Bradford was also part of the supervisory team that implemented intelligence-led policing in the district at the patrol level. Per the HCSO, the concept has led to double-digit drops in the county’s crime rates. The major serves on the Hillsborough County Juvenile Justice Board and Hillsborough County Commissioner Sandra Murman’s Blue Ribbon Committee for Child Safety. He completed the Florida Department of Law Enforcement’s Senior Leadership Program in 2013. Bradford and his wife Susan, an HCSO captain in District III (who worked in District IV for 11 years), live in Lithia. Their son, Matthew, is a senior at Newsome High School and their daughter, Elizabeth, is in her first year of law school at Florida State University. In January, the couple will celebrate 26 years of marriage. The major is an avid reader, especially of history, a runner and a family man. He’s also been a member of the Bell Shoals Baptist Church for 23 years and is currently a deacon. Col. Donna Lusczynski, commander of the Dept. of Investigative Services and Bradford’s current supervisor, said the major is greatly qualified to serve the people of southern Hillsborough County. “He’s familiar both personally and professionally with the community,” she said, noting his extensive experience in patrol and investigation. “He’s very aware of what’s going on, and of policing trends and issues. 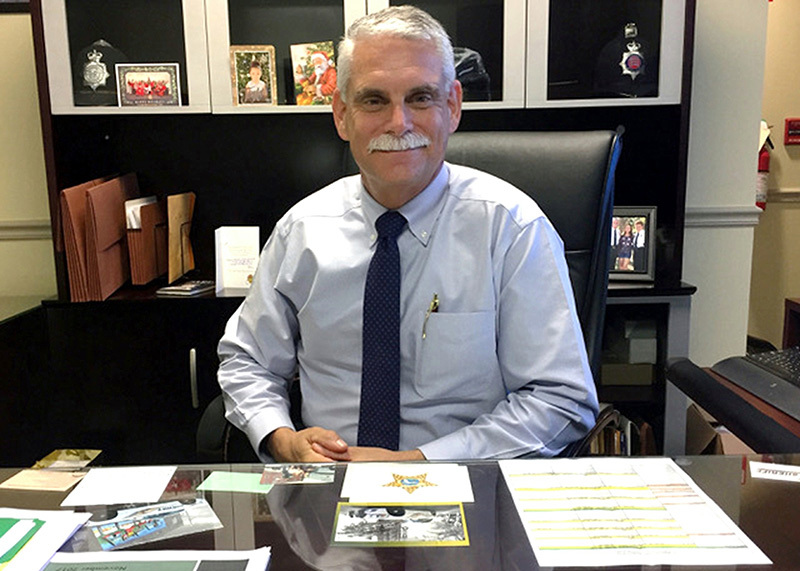 After 36 years with the HCSO and the last three as District IV’s major, Bullara is headed for retirement. Now 60 and living in Little Harbor, he’s looking forward to playing golf and doing some serious fishing. Despite that, he’ll miss his deputies and staff. Bullara, the HCSO’s most senior major in terms of years in the rank, deeply appreciates the South Shore community. 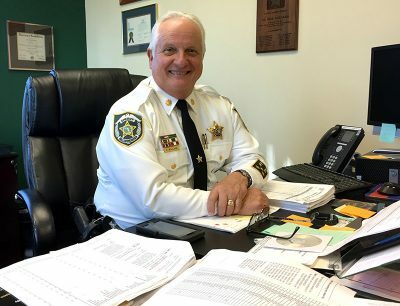 In looking back, Bullara is proud of his time with the sheriff’s office, especially his involvement in the formation of the Child Protective Investigations Division, where he was a major for six-and-a-half years before coming to District IV, where he “reinstated old traditions and fine-tuned” operations. “I didn’t try to reinvent the wheel,” he said. The major has confidence in his replacement. In retirement, Bullara will get to spend more time with Laura, his wife of 28 years, and three adult children.